A few years ago, we built a forge based on Larry Zoeller’s designs. We’ve used it a few times and now it’s time that the forge itself gets a bit of maintenance. 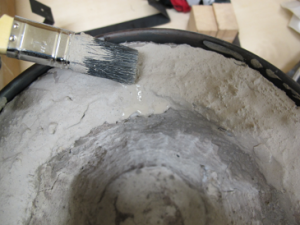 This is nothing more than recoating the inside with a refractory coating to help keep the insulation in good shape. We did a quick test fire after letting it dry for a week and all was well. This was written by gary. Posted on Wednesday, October 5, 2016, at 7:00 am. Filed under Project. Bookmark the permalink. Follow comments here with the RSS feed. Post a comment or leave a trackback.